Our Phat Tommy Line of Safari Trunks are created from maple and solid china hardwood. 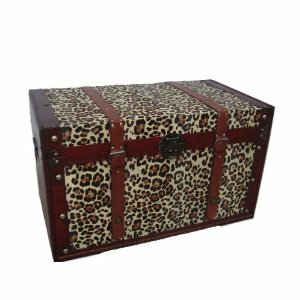 This fabulous chest has a leopard pattern with wood trim in a warm cafe finish. Authentic pewter- and gold-colored nailhead detail and faux leather straps with buckles give this chest an authentic look, which blends beautifully with the modern pattern. It’s perfect for storing your favorite blankets, clothing, toys – whatever you need to organize and stow away – and it adds smart style to your decor. We are able to offer you a great value on beautiful handcrafted chests by importing directly from the manufacturer. The handcrafted nature of this product will produce minor differences in design, color and sizing. Subtle variations will occur from piece to piece, adding to its unique qualities. Measurements may vary slightly. Our Phat Tommy Safari Collection of Trunks are hand-crafted and tailored to enhance the existing decor of any room in the home. The chest is a classic piece of art and will provide an elegant way to store any item in your home.